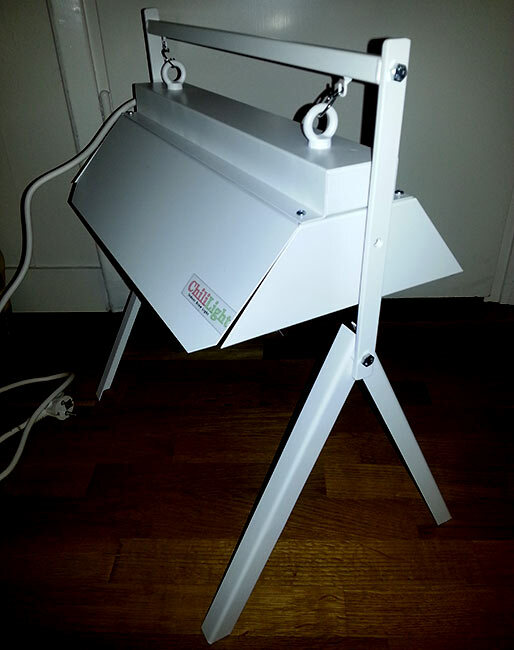 I raffled a Mini Chililight a plant lighting on 30W with position! » Chili – Hobbyodling av chilipeppar! ← Retraining 1 and 2 by chiliplantor. 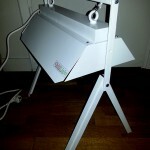 I raffled a Mini Chililight a plant lighting on 30W with position! 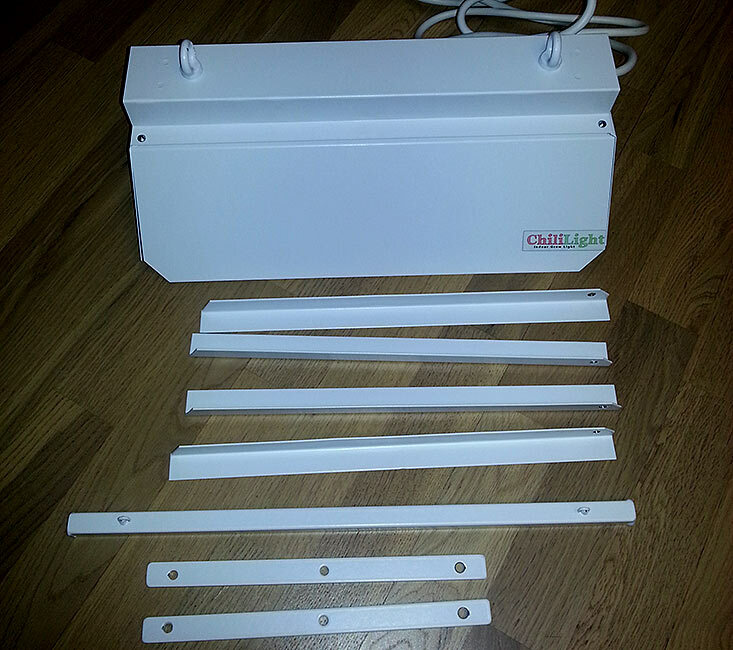 Mini ChiliLight is a new lighting that is meant for uppdrivning of small chiliplantor. in a white matte color for good reflection and durability. Measurement of the light fixture 400x250x110 mm. Scaffold height 500 mm. It joins the position with. 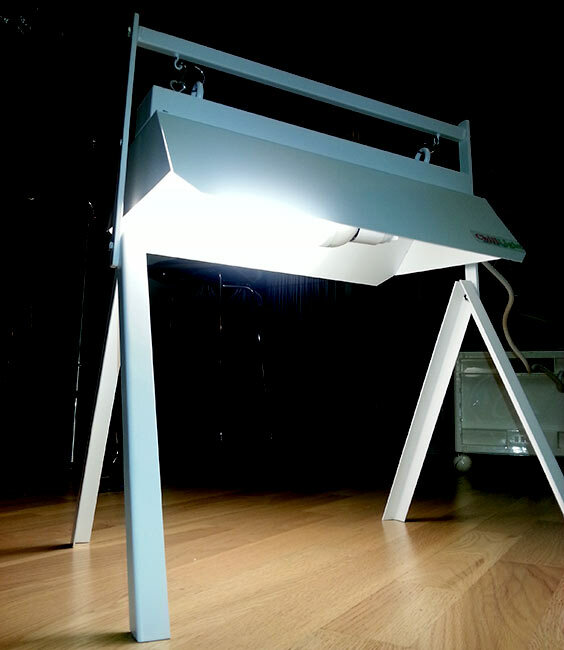 135 Responses to I raffled a Mini Chililight a plant lighting on 30W with position! Never liked the chili, thought it was a completely unnecessary spice. Then I got into a discussion with Anneli on facebook and she sent me a small sample jar. Competition with Stig wants to the right of the. In my second in Ostersund, I have bad light as little extra light would be a nice addition. I'd love to give the light of my grandchildren who fills 10 years soon. We sowed some seeds in the fall but his plants are too dark now. I want it to grow well, so that his interest lasts. Of course you should be with! Fun with such competitions! Should cultivate chilli for the first time this year and look forward to this, it will be exciting! My seedlings are in great need of better lighting. Would be great to win the light of my seeds have already sprouted and I miss lighting. Then it is custom made by a professional and good looking does not hurt just! What a chilli light would fit nicely in my living room where I was supposed to put my chilli plants. Would be perfect for my seedlings. A perfect complement to Stig's big fixture. If you live, like me, Skellefteå in northern Sweden, and the cold is angrier at chilli far into the month of May. Darkness on the snow brings melancholy nutrition. We have no Furnishings but sitting on kicks all year. Om..jag says just about.. I would draw the winning ticket in life raffle so may not only my chilli plants vårkänning but also a grower whose chilli innocence was now in January.. Only opportunities in other words.. I so want to have such a complement to the kitchen to push up the seedlings ( it's so hot o good in the kitchen) and my partner is tired of my temporary solution with a low-energy bulb hanging with an old lamp shade curtain rod… With a light tripod so the whole thing would be solved both neat o practical 🙂 Then I have more places that fit better. During other years when I did not sow chilli plants, I think that this could huh perfect for growing your own herbs. What will this cost then? Then my interest in chilli only stuck to cooking before I found the Stig's page, now I want to both eat and grow, Thanks for all the inspiration. Has put quite a lot of seeds that have come up, but looks a little scrawny out because I do not have extra light, they are namely the windowsill 🙁 as little light had not damaged ! need much light now in this darkness, so it would be nice to win the lights. Now they will lose ground. This year I can not fail, or? I miss something? It would have been awesome with a real illumination ! It is fötsta time I grow chilli iår and I took probably really water over my head to grow too much, a little extra light sake I do not think damage. Well.. It would have been nice to have some light now when to start growing chilli, it will be fun to test. But it is pretty poor student at 17 years so can not afford any wise lighting so it would have been nice to win a. Stuff Mad as I am of course means that I'm dying for a stylish lighting fixture! I would like to compete! I would be overjoyed if I could win one of these. Just started to grow in my apartment and compete with my father who has 3st greenhouse full. Maybe this would even the odds a bit?? 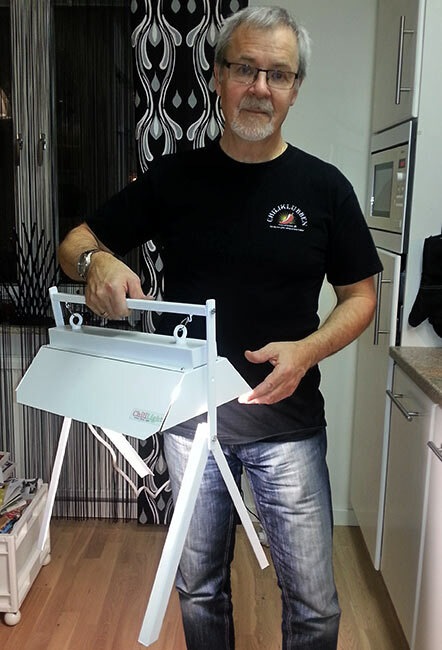 Would really like to win this light that I wound and pulls lot of seeds o sticklingar.Hoppas that luck has turned so it will be me who wins this lighting that illuminates both seeds and cuttings and my family. 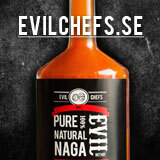 Lives in Lapland, where the sun do not even get up when the chili will in the earth – that good lighting is essential. It would certainly facilitate our (= Me and my partner ') ambition to become completely self-sufficient in chili, so privileged is set as the first crop of self-list. And it takes a lot of chilli sauces in this household, so it is no small goal!! Never get the thumb out to fix up the lighting to get my plants. So a lamp had not been wrong so that more can be planted and grow up. 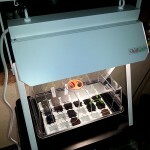 I'm only a hobby growers and all my equipment is only the budget which is what my wallet permits. It gets very jealous of all the pictures on Facebook of all that has been fine ramps and boxes and see that it pays all times. Hence I should win this delicate position because my wife did not think we should spend our money on expensive fine lighting. My first year as chilli growers and I are already dependent. Will not be long until the girl says I get to choose either her or my plants. Just lighting is one thing that she gets incredibly angry over. When I showed this light, I received an approval so would be perfect in our little apartment 🙂 Thanks trail! Yes, they really do the trick! so therefore Yes please – I would like to have! I'm not Jarmo but now lives in the same country, Finland. A country known for saunas, knife fight and not be able to show feelings. We do not care about the forest and wipe ourselves with bears. As all my time is now about to be the hard time I do not build one yourself. Therefore want to win. Very curious about your self-made lighting fixtures. Been thinking about doing something similar for yourself. 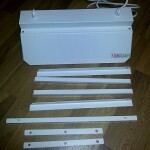 Right now I just Biltema fixtures with 2×36 w. Large bulky and not nearly as smart as your. Would be perfect for places in the house where I can not put my chilli plants today. Would like to win it for my girlfriend who has sown a lot of chili! 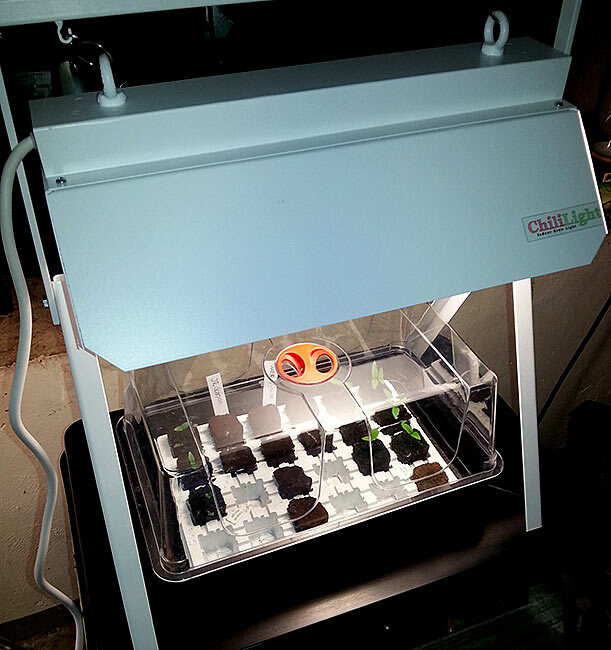 To get fine chilisar must have good lighting, have a box of incubation hope for nice fine plants…. any day they start to look up, saying that they would love some toppenfin lighting. Wish summer was here now. Why not manipulate my plants. Has received permission from her partner to grow some at home, have a decent place but not the opportunity for lighting. My current location is in a window that draws cold and with a homemade light cardboard, -foil and an advent star. Sowed many seeds ( Starter mistakes) which I have read about :)) . It is the result that I have had to give away 8 pieces and 13 left. Do not fit more fluorescent fixtures in larger size. The most exciting chilli cultivation is to drive up from seed to small plant and then be able to give the little ones to friends and acquaintances o get them interested . I really need more light to my plants did not at all live up to the look that many of you have. Right from you Stig as always surprise us with raffles and various advice on chilli cultivation. Fun competition and good price! Hi! 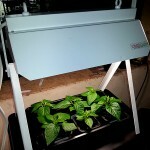 I would like to win a mini chilli light because it would really speed up my chilli cultivation. Additionally put style at the. I would cultivate the strongest chilli I get and make a convincing hot chili sauce for my partner, who does not like the chili I have now is strong enough! I want to win this light that yes indeed is in need of more light to my cultivation! For me the apartment and scarce windows with sunshine, this would be a dream. Had bought unless the economy were too poor for it. My BOC would enjoy this lamp ! Do not grow chilli in the apartment because of my daughter, and an angry Attached you will stick to förådet. as had been fine with a good lamp that lights up my tillvarå in my little corner! Want to win one to give to my boyfriend. I have great window to grow chilli in, but it is already full of andraårschilisar. For us to be able to grow with him also we would need a lamp! The other day, it was Christmas Eve and I got my package from Chili Club. Guess what I need! It started with a redcherry plant, then it has escalated in many varieties. the lack of space and hard to get a good lighting. Your lights are the sovereign and you're awesome chili. I would be happiest with your lamp! Some light to newly purchased seeds never hurts. Especially now in winter. It would I want to use on the job 🙂 Need more room to grow on. Have just started growing chillies. Starting on a small scale so this is perfect. Normally it's my boyfriend who grow chilli, but this year, I'll show her that even guys can grow chillies. But then I need a lamp for the small plants. A stylish and functional lamp for the chili plants are always needed. To be able to pull up my chili plants in a better place in the apartment without the neighbors to call the police in the belief that there is something illegal to light up the screen. My chilisar get too little light in the window & grow poorly..
so hope, I hope to win! Have been looking high and low for a good lighting and I find this to draw :). Of course I do not want to miss the chance to become a happy owner of this. My plants had been very happy if they can bask in the. Keeping my fingers crossed for the 7:(e) ! It is the light that made. To, that I want to win so I can be so right now! Have no lighting yet . Great fun with a contest. I have tried cultivated in 2 years, but manages very bad, received the highest 10 fruits of about 83 plants(this year), said probably too late. try now Vintra one with lighting in the bath room, reaching suffered light from ebay. Have just started growing chillies but has no optimal place to have it and no light. This would be perfect for me, so now we can only hope that I like my new hobby! I've just started trying to cultivate chillies! Is in need of a good lighting. I keep my fingers crossed! As usual when I grow chili so I go so hard I is not got room for my plants on the balcony, why do I need extra lighting so yes you can hide some in the closet, You do not want to yes to have to kill my plants! As Chili Growers in the apartment, I am always in need of more light sources! It had been my first, because I do not own any plant lamp. It would be interesting to cultivate my first chilis hand with tips, but also with a light from you. Etersom I study how to cultivate chilli best in small spaces, would this mini chilli light to be perfect. Has grown before in both the open and in greenhouses, but has now moved to a small apartment with minimal balcony so I simply had to adapt. But it is difficult to draw down from nearly 100 varieties to perhaps 10… Hope on tour! I'm new at this and do not have good lighting.. Unde this was probably my chilisar happier..
Well then, we live in the north and the sun is not enough so we all know that self creating small suns can do wonders. Would have to get started with my chill ice now, but has not started due to lack of time. A New Light would increase motivation! I started growing chillies for the 25 years ago. I have uppptäct that you need to get started with the cultivation as early as possible. Therefore, a mini light sit nicely in my home. Although I now live in a small apartment with minimal growth opportunities, I would not stop growing chilli. It would be nice in the kitchen! Right now I run up my first groped plants in my REARER! Yes, you read that right! It takes what you have said Kajsa Varg and I agree! With only a window to the south, it would be good with a little extra light to the chili are. This would be nice in the kitchen window. Have never cultivated chili inside past. 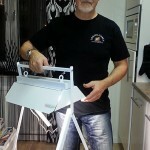 Bought a lamp for wintering this year and would need a cultivation light to launch seed sowing earlier. I always have a couple of chilli plants in the greenhouse. But this year, I and my son got us completely. We soon chilli plants everywhere in the house and the existing lighting soon enough not to. Your mini chilli light looks really good !!! If in need of more lighting, so I really hope I win the lottery. Oh oh so many who could answer. I like the first-time growers have not a chance, but this light that I may have in the laundry room is well the only thing my husband would accept. He is not fond of all my sådder in the living room so it will be hard enough to push up NGR chilisar here! The grows almost not at all in the lack of light even though they are in a sydfönster. My boyfriend at 7 years has left its seeds here now. Had been wonderful to surprise him with this in her room. As a new member of the chili club with an envelope of seeds at the post office feels like a little extra light in the darkness of winter had helped me a long way to succeed with my cultivation. Other year's chili projects, this year it should be powered up Jalapeno several varieties and some larger the Arbol plants. With a light, I have the opportunity to run up more varieties and share with me when things get too many small. Chili produces pain, about as much as Katla beloved Brothers Lionheart. The same love-hate relationship, I have to grow in the window where I wound, but not where the sun reaches. In this light, I in the kitchen shine, when my chili in the food received shock. so this I really want to win so I can maybe grow a larger scale. Cultured 4 chili plants for the first time out on my balcony last summer and was really pleased with the harvest. Absolutely incredible taste and smell compared to what's in store. This year I thought expand variety and grow directly from seed and are looking for just such a chilli lamp that you show up. Thanks for any info on your page! Cultivated chili for the first time last year and they were -Hot. Would like to try to grow a little milder variant of this year and then it would be good to have them in a little separate section where it need not be so “natural light” Have as much plants in the apartment where they had been trained that it is difficult to place (600-700 St). Thanks also for a lot of good to read about just light pipe fittings which I'll figure on right now. 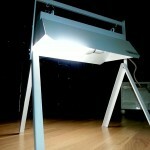 I would love to win a chili lamp for I am in desperate need of a. Now my small chili plants starting to look up, and they have become långskrånkar directly. I would also like to put myself in the, for now do both I and my chilis little extra light. Has cultivated chilli in many years. Have never had a good, smooth lighting to my sådder / plants. 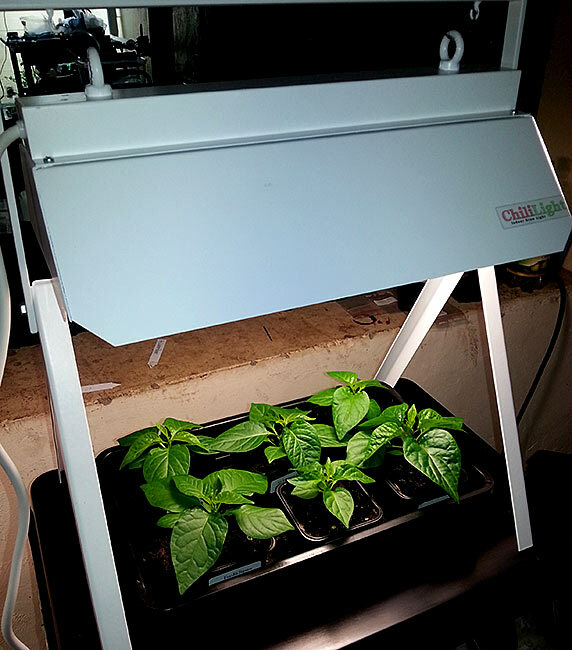 The Mini Chili light illumination get plants that much needed light they need and great start for the cave. Moreover, it is really neat. Because I love chili and would enable them to better their start in life. Has grown much chilli until the storm Simone totally destroyed my greenhouse. But no, I will probably fit yet somehow. I love to grow chilli but it is often not so good during the starting period that I have imagined. The biggest problem is that the only light station I have is quite large and otympig. It is poorly positioned so that it is usually in the basement. Growing without additional I jus do not go with us. This I want to win for my dear husband! It would be a nice surprise as he sat several evenings and sought the perfect lighting for their chilli plants!